I would like to share some of my knowledge about implants every now and then, because I think it’s important that people know more about these wonderful devices. Remember that I’m not an expert, I just like to dig into what I don’t fully understand yet. I would like to talk about how an electrode transfers sound to the brain: about the position of the electrodes and the speed they fire with. First of all, I would like to share two wonderful links that cover two subjects: the “place theory”, which explains the pitches being perceived in different places in the cochlea, and “rate coding”, the fact that firing at a lower rate gives you the impression of a lower tone. If you don’t feel like reading all these papers, but still want to know more about sound coding, I’ll sum up the basics for you. If you stimulate electrodes in the cochlea at different places, you will perceive a different pitch. The electrode closest to the entrance of the cochlea will be perceived as having the highest pitch, while the electrode placed the deepest in the cochlea will generally have the lowest pitch. 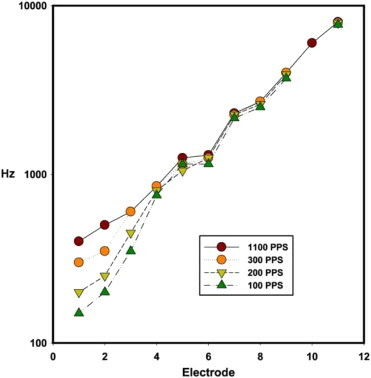 With the longest electrodes, it’s usually more difficult to tell the deepest two electrodes apart, or there may be pitch inversion (meaning the deepest electrode sounds higher than the other, instead of lower). Sound is being delivered to the cochlea in pulses. If the frequency of these pulses is lowered, the sound will be perceived as a lower frequency. Of course, this is not all there is about coding sound. There are a lot more things, like the temporal features and the envelope of a sound, but I honestly don’t think I can wrap my head around things like that until I actually experienced them. I hope you enjoyed this post! Please stay tuned for December 17th, as I have my last pre-cochlear assessement appointment with the hospital then, and then we’ll decide the date for the operation. Looking forward to it! Next: Cochlear implants: realistic expectations + what to expect? How did I learn to speak? Some people don’t understand how a deaf person can learn to speak if they can’t hear themselves. They always assume I can hear much better than I actually do, because my speech is quite good. My speech isn’t flawless, but it’s clear and understandable. Every now and then I stumble on the s-like sounds: s, ch, sh, sj. I also pronounce several vowels a bit too nasally. How did I learn to speak, despite not hearing anything? In the start, I mostly spoke without making any sound. I just moved my lips in the way I saw people doing it, and as I grew older I also learned that I had to make sound and hold my toungue in certain positions while speaking. I learned how to make sound by feeling other people’s faces while they make sound, feeling how their nose and their throat “vibrate”. The position I had to hold my mouth in was learned mostly through cards which show the position of the teeth and the toungue, and the flow of air while pronouncing a certain letter. They looked like these, and the ‘important’ parts for each letter were marked. To me some of these cards don’t look right though, don’t use them as a reference! I also learned to read very early, because together with learning a specific sound, I automatically learned the correct letter for that sound, usually a phonetic letter. We also had little post-its hanging everywhere in the house, with a picture and the name of that picture. Those pictures could be pretty much anything: a window, a chair, a horse, a spoon, a desk, a fridge and so much more which I don’t remember. When I mispronounced something, I was usually gently reminded to pronounce it the correct way. Back when I still couldn’t read very well, I loved to watch captioned movies while having the remote ready to pause the video when new captions came up. Since both me and my brother were deaf (and having two deaf kids that want to kill each other in the same house is quite a challenge) I also used to stay over at my lovely grandparents a lot. Since we’re talking about my grandparents, I feel like my grandmother deserves a little special place on here. I love my parents and my family a lot, but she holds a special place in my heart. Since my kindergarten was close to her house, I only went to school in the morning. I spent all afternoon together with her, reading, playing games, acting, going to the park, making stuff and just having awesome kid time. She also brought me to numerous speech therapy appointments, to the revalidation centre, to where they would fit my hearing aids, pretty much to wherever I had to be at that moment. She also went to the library often, bringing a lot of interesting books with her every time, which I loved to devour. She would also read me stories before I went to sleep, when I wouldn’t insist to read the books myself. From elementary school until I went to university, she also came to pick me up every noon, stuffed me with delicious and healthy food and brought me back to school afterwards. Even now when I’m going through this cochlear implant journey, she’s always there by my side, though she’s slightly opposed to the idea of me risking my residual hearing. She thinks I’m perfect how I am and that I shouldn’t change at all. What an awesome, silly lovely lady she is, isn’t she? She’s amazing. Okay, back on the topic of reading and speaking. When someone can read, and knows how to translate the letters in the correct lip, mouth and toungue positions, they automatically learn how to speak. Knowing these lip, mouth and toungue positions is just a matter of practice, perseverance and patience. I had speech therapy sessions from when my deafness was diagnosed (1 year) until I was 14. I can’t lipread things easily if I haven’t read them before. Names and places sometimes have to be written down before I understand them. Therefore I also think that reading a lot is crucial for a lip-reading child to get a good foundation for languages. If you have read a word before, you know how that word is pronounced and how to read it from someone’s lips. This concludes this post. Tuesday is my next appointment at the hospital, I can’t wait!